MONROVIA – The Roberts International Airport (RIA), Liberia’s only landing site now for heavier Planes from across the globe, was one of the hosts for Missiles and grenades launched by some persons or groups during Liberia’s civil war that started in 1989. The RIA remained disfigured from the 1990—the actual time the bombardment started—to around 2001, when the Government of warlord-turned-President, Charles McAurthur Taylor, began post-war repair works on the RIA, through the Government of Taiwan. Repair of the lighting systems and fencing of the entire Airport were some of the works done. But Charles Taylor resigned as President of Liberia in 2003, which brought to automatic end his government’s work on the RIA. Then entered Mrs. Ellen Johnson Sirleaf, as successor to Charles Taylor, Africa’s first female Head of State, in 2006, to continue with the RIA repair project. With insufficient funding with her government to undertake project, the new Liberian Leader in raced to her Presidential colleague, Xi Jingping, over the government of the People’s Republic of China for assistance. The Chinese Leader was moved on empathy for his Liberian female colleague’s ‘pleading’ and responded with sending a State-owned Chinese Company named China Harbour Engineering Company (CHEC) Limited, founded in 1980. “We feel ashamed when a plane lands and you hear kpu-ka…kpu-ka,” the Liberian Leader said at the groundbreaking ceremony, referring to irritating mechanical sounds of a plane moving in pot holes in Liberia’s International Airport’s Runway during that time. “The repair project costs 49.8 million dollars,” CHEC’s Project Manager, Zheng Yuhe, disclosed to a team of Liberian journalists during interview at the Company’s Head Office at the RIA in December, 2018. He was with the Company’s Engineer, Xu Yang; and the Commercial Manager, Wong Tengfei during the interview. Some of CHEC’s other tasks on the RIA, besides repair and maintenance, are: repair of all three Terminals, construction of a 15,000-square Parking Lot for vehicles, installation of lighting systems, and installation of water-supply channels. “The Runway and the Tower are not included in the contract the Government of Liberia signed with our Company,” Mr. Yuhe continued. 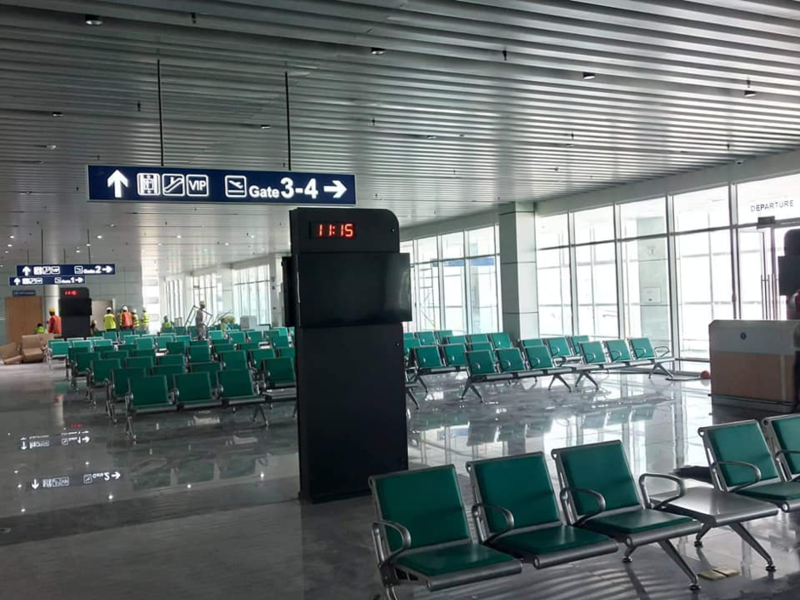 “The new Terminals will host around 400,000 passengers every year,” Project Manager Zheng Yuhe disclosed to the press people, at the end of the short documentary. Liberians have contributed immensely to CHEC’s success on the RIA, Project Manager Yuhe revealed. “We hired 22,000 locals in 2017, during the peak period, dry season,” he said. However, Zheng Yuhe said, the Company sliced the number of Liberian employees to below 60, later. “We did that on the rainy season, which forced us to halt many of our operations for a time,” he pointed out. The RIA repair project will officially end on the 15th day of January, 2019, the Company’s spokesperson disclosed to the Liberian journalists. “This is the hand-over date, after inspection had been carried out by the Government of Liberia in December, 2018,” Zheng Yuhe said. The China Harbour Engineering Company (CHEC) Limited is the “500th Strongest Company in the World,” Project Manager Zheng Yuhe had boasted earlier, during his introduction of the Company to team of journalists. Now in 100 Countries, CHEC’s ‘engineering coverage’ Covers Sea ports, bridges, highways, and railway—besides Airport.